Whatever Apple needed to fix, it appears to have done the job. While there are bugs in iTunes 11 (as there are in virtually every piece of software), they appear to few in number and relatively minor—especially when you consider that iTunes 11 is a major redesign stuffed with new features and interface changes. At least that was the impression I had after browsing through Apple’s Support Communities iTunes threads in search of user complaints. The biggest complaints regarding iTunes 11 were not about what wasn’t working. Rather, they were about what was no longer there—desirable features in iTunes 10 that are MIA in iTunes 11. The range of missing features lamented by iTunes users was wide and deep. Here are the highlights. Cover Flow: By far, the most frequent lament was the loss of the Cover Flow view for Library items. I was surprised (given that I never found this view to be especially useful) that many users described Cover Flow as perhaps their favorite feature in iTunes 10. Many people have been so upset about the loss of this option that they are looking to downgrade back to iTunes 10. Display Duplicates gone: The Display Duplicates command, located in the File menu of iTunes 10, was dropped from iTunes 11. At least for now, users who found this a valuable way to locate unwanted copies of songs will now need to locate a third party utility to take over the job. However, we may see the feature return in an update to iTunes 11. Shuffled playlists don’t sync: According to what I read, you could shuffle a playlist in iTunes 10 and have the physical listing of the songs shift. This meant that, when you synced your playlist to an iOS device, it would sync the newly shuffled order. This no longer works in iTunes 11. 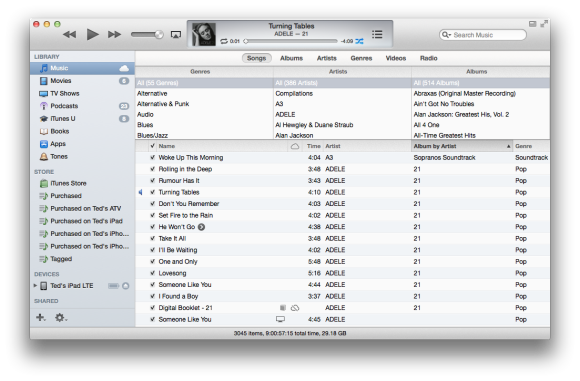 While you can still shuffle the playlist order of songs in iTunes 11, the listings remain static. As such, the shuffled order does not sync to iOS devices. While I’ve never considered using this option, numerous users are quite upset about its disappearance. Album Art area gone: In iTunes 10, the lower left corner of the main window displayed the album cover art of the current selection. This area was especially useful for music that had no associated album art: you could drag your own image to the space to add desired artwork. This is all gone in iTunes 11. However, you can still view a smaller image of the cover art of the currently playing item in the display at the top of the iTunes window. And, as pointed out by Kirk McElhearn, you can substitute your own art by dragging it to that display or via the Artwork tab in iTunes’ Info window. These items do not exhaust the MIA list. Not by a long shot. For other examples of what’s no longer present in iTunes 11, check out a recent TidBITs article as well as Macworld’s review of iTunes. Among other things, you’ll learn that you can no longer open playlists in a separate window or have the Column Browser appear along the left side of the iTunes window. If all of this makes you long for the good old days of last month, you may find yourself considering a downgrade back to iTunes 10. If so, several locations—including this Apple Support Communities thread or this similar one, offer details on how to do it. You’ll need to do more than simply reacquire the old app; you’ll also need to reactivate your old iTunes Library file (which hopefully still exists in your Previous iTunes Libraries folder). Be warned: If things don’t go as expected, you could wind up with “missing file” problems in your iTunes listings. AirPlay missing: Many users have been unable to locate the AirPlay icon/button in iTunes 11. Fortunately, this is not another case of Apple eliminating a function. Rather it is a fixable bug. The icon should be just to the right of the Volume slider. If you don’t see it there, launch the iTunes MiniPlayer (by clicking the icon in the upper right corner of the iTunes window). When you move your cursor over the MiniPlayer, the AirPlay icon should appear. Even better, when you return to the standard view of iTunes 11, the AirPlay icon should be restored to its rightful place. Search slow: If you have a very large iTunes library (probably a minimum of around 10,000 items), you may find that using the Search box in iTunes 11 is agonizingly slow. After typing your first letter, you have to wait and wait and wait… before you can type another letter and before any results appear. Happily, you can speed things up again via a simple work-around. Click the magnifying glass icon on the left edge of the Search text box. From the menu that appears, uncheck “Search Entire Library.” Assuming you have Music selected as your Library category, the gray “Search Library” text in the text box should shift to “Search Music.” Your searches should now run at the expected speedy pace. This has the further advantage of limiting searches to just the category you’ve selected. For example, if you select Movies instead of Music, the search will only examine your movie items.